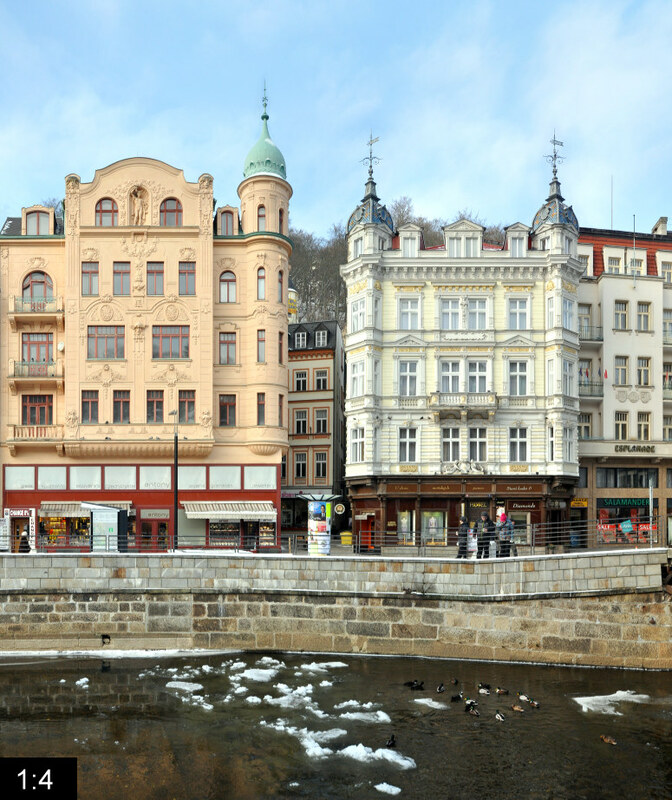 The Stara Louka (german Alte Wiese, meaning old meadow) lies on the north side of the Tepla river in the spa centre of Carlsbad (czech: Karlovy Vary, german: Karlsbad). 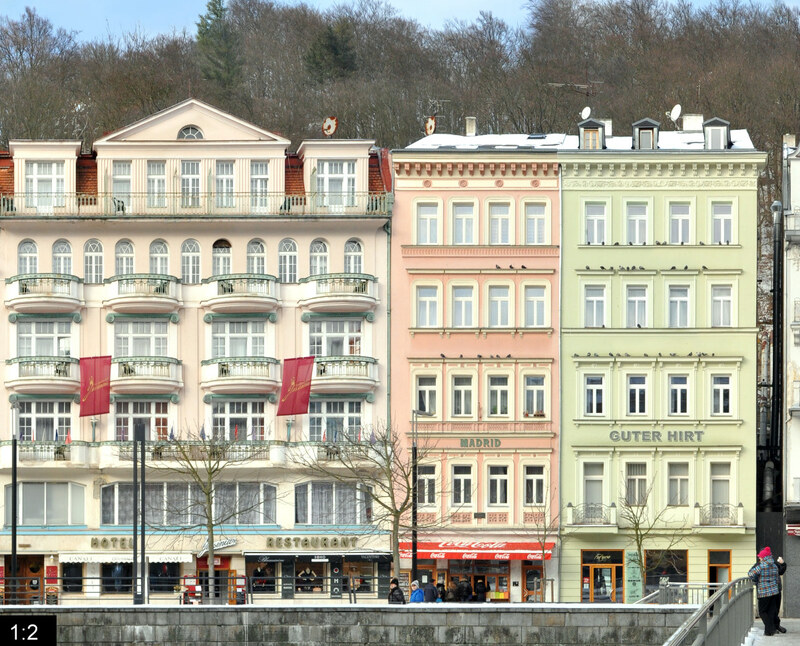 It is the most prominent street view in the city and together with the continuing Lazenska street its main esplanade (click the panorama for a zoom). It is interesting to compare the view with a photography from 1900 (see Wikipedia) when this area was packed much more densly with sales stalls. Here the Tepla valley is rather narrow and the hills rise right behind these buildings, so we can actually see the trees atop, including a viewpoint pavillon on the right side. Further down the street on the left side, the Art Nouveau Grand Hotel Pupp is situated, famously staging the setting for the Casino Royal in the James Bond movie of the same name. 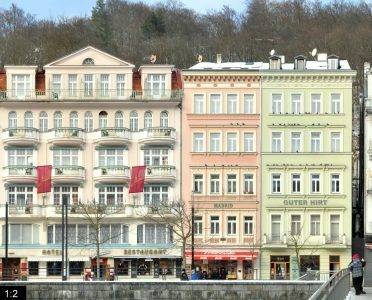 For centuries these grand buildings along the Stara Louka have housed hotels, restaurants, cafés and luxury shops. The names of them are still multi-lingual. Here we see amongst others the Houses Ostende, Maltezsky Kriz, Krasna Kralovna, Palacky, Jessenius, Madrid, Guter Hirt, Café Elefant, Halada, Mozart and Esplanade. 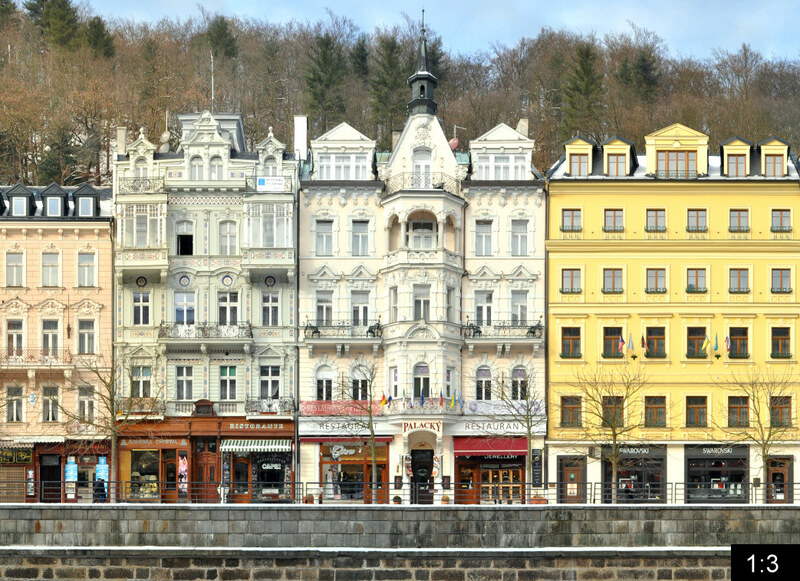 Carlsbad was the most prominent central european spa town around 1900. Its famous visitors were, beside the european nobility, amongst others Goethe, Karl Marx, Morzart, Richard Wagner, Atatürk, Bach, Beethoven and Sigmund Freud. Russian Tsar Peter the Great visited the bohemian spa town twice. And it was Goethe who said he only knew three cities in which he would want to live: Weimar, Rome and Carlsbad. The city owes its name and foundation to the bohemian king and Holy Roman Emperor Charles IV., who founded the city around 1350, appraising the healing power of the hot springs in the area. Shortly afterwards he gave Carlsbad the title of a Königsstadt (a king’s city). After the end of the Habsburg Monarchy and two world wars the city lost its international importance and its german speaking population. 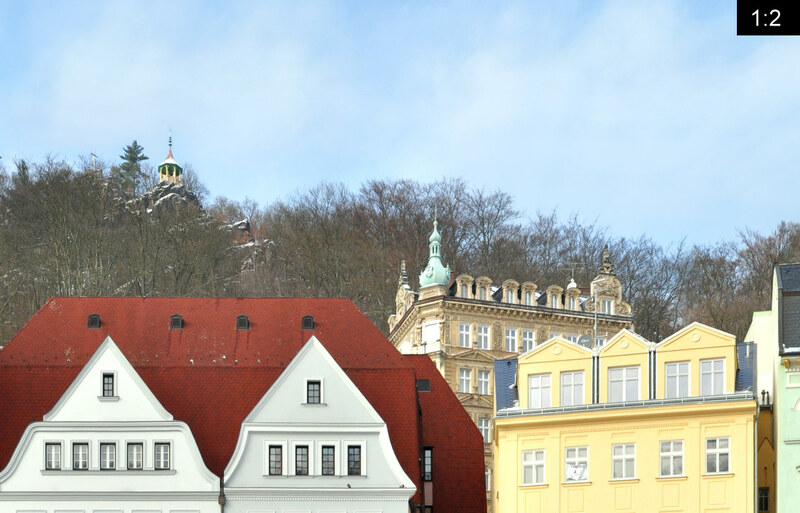 Since the fall of the iron curtain the city regains its importance as a spa town and international tourist region. 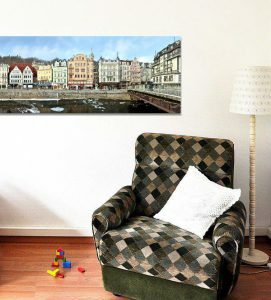 In recent years, the city has become a popular holiday place for russians especially. 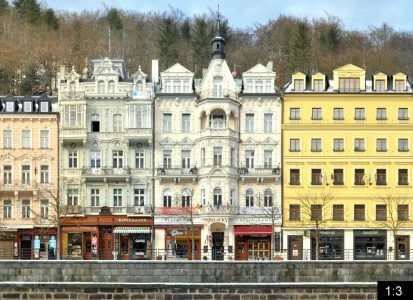 This cityscape panorama of the Stara Louka in Karlovy Vary was presented in week 18 of our 101 weeks 101 cities of europe project. The detail views on the right include an alternative classic panorama view of this same scene from one viewpoint as a comparison.